A deep passion for music, connecting with people, and a love for life are the focus for Deepak Sharma as he continues to grow as a DJ, producer and record label owner. The story of Deepak Sharma's rise can be traced back to 2001 when as a promoter; he was booking and playing alongside some of the world's most recognizable talent. One particular night opened the door for Deepak was booking Fabric resident's Craig Richards and Lee Burridge as Tyrant at his Wednesday night soiree at a lounge in Brooklyn named Boogaloo. The night was a resounding success, and lead to Deepak being asked to release a mix compilation reflective of his style of music and vibe of the venue. Finally, after nearly two years of work, Deepak released Boogaloo. Brooklyn. 3:23pm in late 2004 with music from producers that weren't well known at the time or a style and sound as popular as today. The compilation received worldwide praise with reviews in leading dance music publications such as De:bug, BPM, Remix, BPM, URB, DJ Times, Raveline, Beatfactor, ClubbingSpain and Sound Revolt. Germany's prestigious De:bug Magazine called it, "One of the finest mix CD's I've heard in a long time." Similar high praise came from Big Shot Magazine, who said, "Sharma indulges us in some of the most pristine minimal techno we've heard in ages. This is mandatory late-night/morning after listening. Not since Terry Francis' 'Architecture' series has a mix compilation explored the realm of tech-house so well." 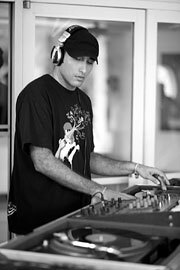 The release of the compilation opened the doors for Deepak to begin to tour North America, South America and gig in Europe. Besides the numerous clubs, festivals and lounges Deepak has played, one highlight includes spinning an in-store DJ set at Virgin Megastore in Union Square, New York City as promotion for the release of the mix compilation. It was during this time Deepak turned his focus to producing. After the release of the compilation, Deepak met Dieter Krause who also produces under the moniker, Laplaceausoleil and had a track on the mix. It wasn't long before the two began to work on tracks together, leading to their partnership. Eventually in 2006, Deepak decided to start Hidden Recordings as a means to take their sound to the world. Since then, Hidden Recordings has provided a wide range of techno to hundreds of DJs and fans. The label's sound ranges from deep techno to atmospheric chill-out with quirky, groovy bass lines and has been played in big room gigs, festivals, to smaller lounges and early morning terraces. The press has taken notice of the duo's rising popularity, with AOL Music's Spinner.com comparing their sound and style to minimal techno giants Lusine, Superpitcher andBooka Shade. In addition the duo has been reviewed in prominent magazines such as XLR8R, DJ Times, Time Out New York, MixMag (UK), Trax (France) and Raveline (Germany), licensed music to UK label Four-Twenty for their Music02 mix compilation and peaked as high as #3 on the Balance Record Pool Top 50 Chart. Global recognition continues to mount as their tracks have reached Top 20 downloads on Germany's Kompakt-MP3, and Top 10 downloads on HRFQin Japan. In 2007, Deepak and Dieter beat out established publishing groups and produced music for Singapore's Ogilvy & Mather advertising agency and their client, Heineken Global. In 2008, Deepak and Dieter decided to expand the Hidden Recordings roster to include like-minded artists that they admire and enjoy musically with Gustavo Lamas, Karri O, Lineas De Nazca and Monkey Brothers. Each release will be complete with a remix by Deepak and Dieter. The label currently has five releases available, and major worldwide partners include Beatport, Kompakt, Juno, DanceRecords, and HRFQ.